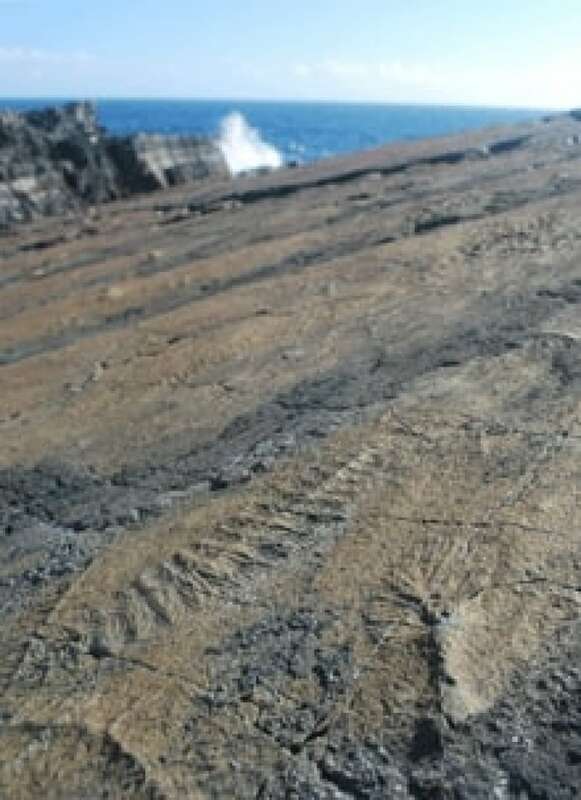 Canadian and British scientists working at Mistaken Point Ecological Reserve in Newfoundland have discovered what they believe to be the first large grouping of "baby" rangeomorphs, 600-million-year-old, fern-shaped organisms thought to be the world's earliest animals. Canadian and British scientists working at Mistaken Point Ecological Reserve in Newfoundland have discovered 580-million-year-old fossilized remains of "baby" rangeomorphs, the world's earliest animal-like organisms. The fossils appear to be some of the first to show a large grouping of these mysterious, fern-shaped, ocean-dwelling creatures primarily in the early stages of life, which distinguishes them from past finds that have mainly contained adult rangeomorphs. Mistaken Point is a world-famous fossil site about 100 kilometres south of St. John's at the southernmost tip of the island of Newfoundland and has some of the world's oldest examples of complex living organisms within its stratified sheets of ancient rock. Many rangeomorphs have been found at the site and in other parts of Newfoundland before, but what makes the recent find unique is that it is the first to contain primarily young rangeomorphs, much smaller in size than the bulk of the fossils found to date. "The particularly exciting thing about this discovery is where you would normally see them up to two metres long, here, they're all less than three centimetres long and some as small as six millimetres, so it's helping to show us the growth style of these earliest possible animals," said Jack Matthews, a graduate student in the department of earth sciences at Oxford University who was part of the team of scientists that made the discovery. A few other juvenile specimens in more advanced stages of growth have been found in Newfoundland and the U.K. before, but they have been considerably bigger and made up only a small part of fossil groupings that otherwise contained mainly adult specimens, the researchers said in a paper published in the July issue of the Journal of the Geological Society. The paper was co-authored by Alexander Liu, a research fellow in paleobiology at Cambridge University and lead author of the study; Duncan McIlroy, associate professor of earth sciences at Memorial University in St. John's; Oxford paleobiologist Martin Brasier; and Matthews. The more than 100 fossils the researchers found in Pigeon Cove, which lies at the western edge of the ecological reserve's fossil protection zone, were unique not just for their size but also because they were from at least three different species of rangeomorph, species that had previously not been found in rocks as old as 579 million years. They were found at the bottom of the layer of rock that contains some of the oldest known rangeomorph fossils and makes up part of a geological formation called the Drook Formation that dates to the Ediacaran period, which extended from 635 million to 542 million years ago. They were remarkably well preserved thanks to a blanket of volcanic ash that covered the creatures when a nearby volcano erupted, preventing them from ever reaching maturity. 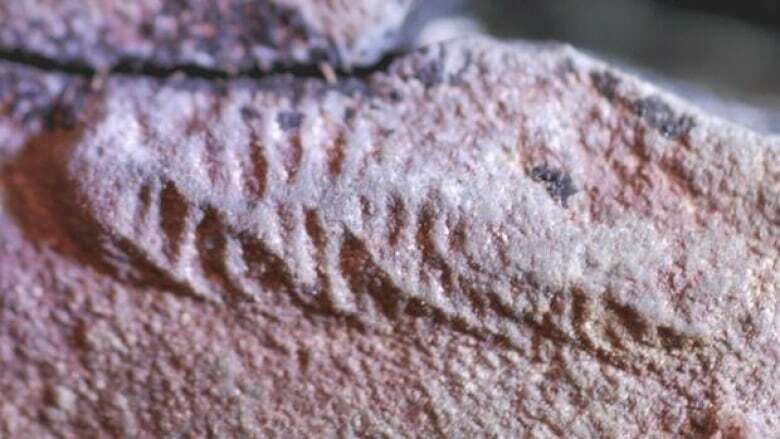 "We think that, around 579 million years ago, an underwater 'nursery' of baby Ediacaran fronds was overwhelmed, Pompeii-style, by an ash fall from a volcanic eruption on a nearby island that smothered and preserved them for posterity," Liu said in an Oxford University news release announcing the discovery. Rangeomorphs are unusual multicellular organisms that lived in the deep ocean during the Ediacaran period. Their bodies resemble the leaves, or fronds, of ferns, but they are not plants since they lived in the deep part of the ocean that does not get any light. They also aren't quite animals either — lacking some of the key tissues and features we associate with animals, such as a gut or a mouth. "The arguments still go on about whether they are true animals," Matthews told CBCNews.ca. "Some have suggested they are fungi. What they certainly are are the oldest complex multicellular organisms." Scientists aren't quite sure where to fit rangeomorphs on the evolutionary tree of life. They appeared in the Ediacaran period but were extinct by the Cambrian period, which began about 542 million years ago and is when animals as we know them began to appear. Like other organisms found during the Ediacaran period, they have no true contemporary equivalents and are a type of transitional creature that existed between the microbial world and the explosion of more complex metazoan life forms that began in the Cambrian period. "The vast majority of the fossils we see in the Ediacaran — there are no modern comparisons to be made, which is why it's so hard to decode what they are," Matthews said. The fractal nature of their body structure, which makes them appear the same from afar as up close, is one of the things that distinguishes rangeomorphs from other multicellular organisms like algae and seaweed. Scientists suspect this structure and the disc-like holdfast with which rangeomorphs attached to rocks and ocean sediment played a role in helping them extract nutrients from the water. 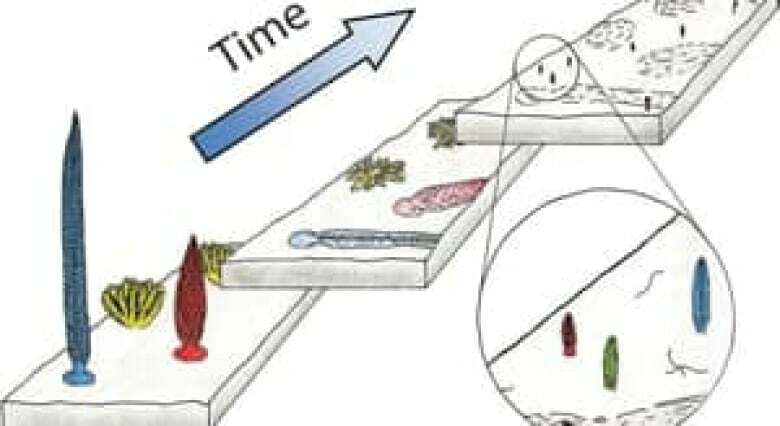 Just how this feeding mechanism worked and why it wasn't enough to sustain the creatures through the Cambrian period is unclear, and understanding that could help clarify how rangeomorphs evolved and whether they truly were the precursors to animal life. Mathews and his colleagues got some clue to the complexity of rangeomorphs when they discovered that the fossils they found were from at least three, possibly four, different species, indicating the organisms must have begun diversifying some time before 579 million years ago, similar to the way new life forms evolved in the Cambrian period. The fact that the multiple species were found in the oldest parts of the fossil-bearing rocks at Mistaken Point, next to the oldest known adult rangeomorph fossils, makes the scientists want to dig even farther back into the fossil record to establish just when they appeared and how the process of diversification unfolded. "That really spurs us on to go and look deeper in time," Matthews said. "Hopefully, there's new fossil finds to be made and new and older rangeomorphs to be discovered."